Election 2010 and Social Media: What are impacts to campaigns, results, and the future of politics? As election 2010 winds down at the polls, analysts on all the networks are scurrying to forecast results, identify trends, and discuss what it all means. It’s difficult not to speculate: is social media playing a role in 2010? SM gained considerable attention in Obama’s successful 2008 Presidential bid, in much the same way that television made a big splash in politics in 1960. Any communication channel that reaches the masses in new ways almost certainly has some impact, potentially even changing the rules. And the general consensus is that the impact extends beyond the U.S. to other corners of the globe. With that said, what is the nature of the impact? Is it lasting, or a flash in pan? On WEDS 11/3 at 1pET, #SMCHAT will explore these questions with some rigor, to get at the underlying dynamics. We will discuss the nature of SM impact to date and ask ourselves what may happen in the future. To what degree can campaigns expect to reach additional and/or undecided voters? Can the younger demographics of Facebook drive material differences in election results? Realistically, can voters be swayed by sites, blog posts or tweets? As Government 2.0 and the Open Government initiatives move to reshape government collaboration and accountability, will there be a ‘pull through’ effect that drives more online, interactive campaign strategies? Will voter engagement via SM be a long-term game changer for politics? If you have opinions, insight or additional questions, please post that here, or on Twitter. You can join the live conversation using Tweetchat at the appointed hour. As always, I’d love to know your thoughts and have the chance to discuss them. Hope to see you at #SMCHAT. In prior posts, we’ve looked at the many aspects of culture that affect large organizations, including the cultural dynamics in government that play out in large state & federal agencies. That really started me thinking. So let’s have a look. Government agencies share a common service mandate, regardless of scale. That means local government exists to support its citizens, and that many aspects of the overall mission would logically be the same. Examples of this: revenue collection, protection services, health & welfare, even natural resources. There’s also a similar political dynamic. Elected officials are voted into office to provide leadership and direction to full-time administrative branches. That can lead to a philosophical divide between the elected and the civil servants, an interesting cultural rift that is unique to governmental organizations, as I covered previously. The net result is that local governments, like their larger state & federal counterparts, will encounter challenges of silo thinking and culture clashes, often resulting in small-scale bureaucracies. It’s the differences that really bring home some interesting new factors. The most important of these is a sense of community. I wrote on virtual community a few months back, but the ‘brick and mortar’ community – including neighborhoods, businesses, recreation areas, and the like – makes up what is typically the strong, vibrant foundation or our day-to-day experience. In a real way, our local communities serve as the backbone of our society. These are critical factors for any town or region to remain healthy. Where these elements are absent, as is the case in regions with long-term economic decline, the systemic problems can be overwhelming. That means local communities and their governments are vitally important to create safe, healthy places for people to live and work. Proximity – by being nearby, it is far easier to participate in local government events and elections, including hearings, council meetings, and the like. Not so with state or federal. I’ll argue that an “intellectual distance” has caused state and federal government to grow more removed from their constituents. It’s a chasm that hurts relevance to the average citizen. Small wonder the feds have long embraced a “town meeting” approach, in hopes of capturing the level of engagment that normally accrues locally. Less-hardened silos – the walls of over-specialization become stronger (quite literally, hardened) with time and scale. Yes, local governments will exhibit turf wars and silos among departments. But because they are typically smaller scale, it should, in theory at least, be easier to begin working across them. Greater impact of individuals – with smaller jurisdictions in particular (towns, small cities) it is possible for strong leaders to drive signifcant changes; this is more difficult with large-scale entrenched bureaucracy. Low critical mass (smaller talent pool). Being ‘smaller’ means there is generally less expertise available locally; smaller jurisdictions may need to lean more on outside help. What does this mean? For starters: state and federal governments should ‘think small’. Local government should be aggressive on capitalizing on the advantages that community and smaller scale afford. They enjoy unique levels of access to their constituents. Moreover, they are closer to organizational models that favor collaboration .. provided they can abandon the silos that are inherited via the notion of government as ‘bureaucracy’. A strong message from our culture research still applies here: there are no silver bullets. Achieving change of any scale is hard, and culture is as strong a factor in local government as with the larger jurisdictions. Government must be willing to interact directly with their citizens, not hide behind the silo’d walls of bureaucracy. Being both small and local can encourage engagement, a fundamental enabler of social change. Is it time for the resurgence of the local community? Maybe it takes a village, after all. The 2.0 Business Relationship: Are you investing in your network? Social media is getting plenty of traction, but I’m still intrigued by its untapped potential, both inside the enterprise and out in open spaces. Stubbornly, several barriers to adoption remain. We’ve been chipping away at these hurdles here, first exploring culture in the organization, and then engagement. Those conversations have helped to surface yet another challenge: how to build valuable relationships (call them “virtual” if you must) using social media. What are the dynamics and limits of “relationship” in a virtual world, where connections are free, global, and easily made? Can true value be achieved? And can we navigate network overload? We’ll start with traditional business relationships, to set the stage. Whether inside or outside of organizations, people are constantly meeting, connecting, and communicating. Results will vary. Some will pass each other by completely. Others will move closer together in their thinking and spark a collaboration, or they might hit a snag, and move further apart. It’s all in motion. A successful organization brings a master plan to the madness. Via work groups, partnerships and/or employment relationships, an enterprise uses structure to bind together groups of people with a shared focus. There’s still that constant flux of relationships: people connecting, communicating, and learning. 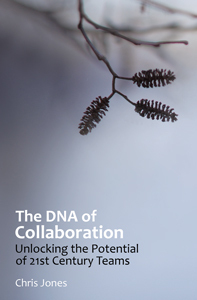 But if and when coordinated, good things happen, and the organization has a chance to thrive. Our hyper-connected world accelerates and multiply’s our ability to connect with people anywhere. Boundaries of time and place are removed. Whether tweeting or blogging, the potential to meet, share and learn from others – literally around the globe – is unbounded. But there’s a catch. As you start to engage and connections start flooding in, you are soon forced to ask: Should this person be in my network? Should I reach out to them? Or will I be wasting my time? Up front, there’s really no way to know. I think most people that exit social media, often in frustration, do so in face of those daunting, never ending decisions. And that’s unfortunate. The possibility of each new social media connection creates a fascinating opportunity. Each connection you make brings the chance to challenge your thinking, expand your horizons, and even to change your path. Clarity of your intent. Why are you here? Are you tapping social media and building your network for a reason? Get in touch with that. Share your intentions right up front. Common ground (context). With intent on the table, establishing common ground is a matching exercise. Search engines and hashtags and communities are all ways to get connected. Believe it or not, this part is becoming easier by the day. Investing in your network (learning to “time box”). Relationships tend to benefit from ‘going deeper’ but time is increasingly precious. This is where many connections with potential fall short. Set aside an evening, a cup of coffee, a few minutes a day for network building. Put a box around the time commitment. That “time box” can be small, medium or large. Change the time allocation as needed, but make a commitment, to yourself and your network, so they’ll know what to expect. Dare to adapt. Ultimately, you may find many connections don’t align with your objectives, but don’t be too quick to filter on that. You may find new opportunities or interests by being open minded and flexible. Sure, building a network via social media can seem overwhelming. But as the virtual world unfolds around us, it’s time to look deeper at its potential to spark new levels of collaboration. We need to think hard about what it will take to build value into our networks. It’s easier than ever to connect with people online in the 2.0 space. But the ultimate value – for you and for your connections – is driven by a shared willingness to focus, to set aside a little quality time on a regular basis. Even if it’s in small chunks. A tweet here. A blog comment there. One or two twitter chats. Okay, maybe three. Are you willing to make an investment? On Wednesday, April 28, agency and industry stakeholders gathered for the 4th workshop in the “Open Government Playbook” series. The session was held at USDA facilities in Washington. With the vantage point of three consecutive Playbook Workshops (one virtually, two in person), I have become a regular. But reflecting on our last session, I’ve grown even more intrigued. The ideas are getting traction, and I’m starting to see momentum. From the last session’s outset, balloons filled the meeting room as Lucas Cioffi, conference organizer, put a demo of collaboration in action. It was a hands-on exercise showing how teamwork could drive value. Participants were learning that more interactions produced more value, as they “traded up” to the highest value balloons. Our special guest, Beth Noveck, Deputy CTO from the White House, shared her vision for Open Government, focusing on the energy building in response to President Obama’s 2009 Open Government Directive. She used a reference to Thomas Jefferson in the “lighting of a taper” as a metaphor for collaboration, with a powerful image: passing the flame to a new wick does not reduce the glow of the original. As further framing, I offered insights on the need for active engagement in effective collaboration, and the need for a clear vision and a strong guiding coalition as a foundation for the required culture change. Next came the main event: session breakouts. For nearly 3 hours, roughly 60 participants engaged in intense conversation and brainstorming, with questions they had generated live, in real-time. Using a ‘self-organizing’ approach, topic suggestions went up on the board, and break-outs formed around topics of greatest interest. In groups of 12 to 30, the discussion around Open Government literally went full circle, as group members shared ideas and possible solutions. Several noted that Open Government has been tried before. Al Gore led the “reinventing government” charge (aka “NPR”) in the mid 1990’s, an effort that stalled. The reasons for that are still debated, with cultural resistance often high on the list. What seems different now is the level of interplay among diverse stakeholders. There is growing energy around OG innovation that runs wide (across agencies) and deep (spanning both political and civil service hierarchies). But the OGD Playbook conversation is not limited to Federal employees. In this forum, thought leaders from all quarters are encouraged to participate, adding much needed insight from industry. The magic is happening in the middle. It’s a place where change can be envisioned, articulated, and given the chance to take root. At the end of the Workshop, as participants summarized what they’d learned, there was energy on quality of inputs and progress. Many said they’d received a level of insight that exceeded their expectations, and said they planned to return. Can OG innovations of this magnitude be sustained? That’s a critical question, and the focus on the next OG Playbook event, targeted for May/June. We hope you’ll come out and join us. Watch the OGD Playbook Wiki front page for the latest. Is there a good way to attack change in organizations? To influence (and maybe even ‘fix’) the complex org cultures that drive the collective behavior of their members? That’s the focus of this post, the 5th in my series on culture change. John Kotter gave us perhaps the best-circulated approach for change in his HBR paper that turned into the classic: Leading Change (1996). With the caveat that there are no silver bullets I believe Kotter provides a strong, intuitive and timeless approach to grappling with change. Unfortunately, too many have given up along the way. Organization change and, more specifically, changing an organization’s culture, share a common scope and scale. They are, in many ways, intertwined. That means Kotter can take us in the right direction. Let me recap his 8-point outline here, providing some 21st century insight and ‘solution language’ of my own to update his framing. Urgency. Per Kotter, one of the biggest enemies is complacency. Why change? Keeping things the way they are is easier. That may be. But the path to major improvements of any kind will be held hostage with this mindset. Low standards or segmented (silo’d) accountabilities can create a false sense that eveything is okay. Change requires everyone to get beyond that comfort zone, to “step up” for something new, different, and better. Coalition. Inspiring and sponsoring change is the work of leaders, so it’s critical that they engage. That means an oversight group that includes respected leaders is key. Without it, the organization will sense management’s lack of investment and will fail to participate. Vision. The organization needs to know where it is being asked to go. Having a strong, unambiguous statement that frames the future state is the only way for the organization to focus on it. A well-written vision is motivating, inspiring the organization to come together. Communication. Many change efforts fail because they don’t reach far enough into the organization. An effective communication program makes the work of the change initiative part of the organization’s daily affairs, embedding messages in as many artifacts and venues as possible. Think ‘saturation’ and you’ll be on the right track. But it needs to be simple and actionable, to retain people’s attention. Empowerment. Employees often don’t feel they can influence the vision. If they feel disconnected and removed from the issues, they will feel ineffective and powerless, and will not to want to waste their time. The key is to establish a link between how specific employee and departmental actions can realize the vision. Barriers must be removed. And management must start letting go of their unilateral decisions, trusting larger cross-functional teams to work things out. There is less control and predictability in this mode, but empowerment creates the conditions where new ideas can spark and flourish. Momentum. Major change takes time, and there will be detractors. Kotter notes that posting interim gains drives credibility when it is most needed – on the long road toward implementation. Focus here also puts energy to fine tuning the vision, applying lessons learned along the way. Integration. I love Kotter’s quote “resistance always waits to reassert itself,” so ‘consolidating gains’ is important. If change initiatives have structures that sit outside of daily operations, we must weave the new programs, policies, people and structures back in. If change remains outside the mainstream for too long, it can seem foreign to the rest of the organization. Anchoring. The organizations culture must reflect the new changes if they are to survive long-term. Organizations tend to have long memories, and if the leadership changes or the initiative is called into question, there will be many who offer the “old way” as an alternative solution to all the change. That is why bringing the culture forward to align with the change is critical. It is not enough to make the case in facts and figures. People have to believe in the change, own it, and live it. Ensuring organization culture incorporates the change elements is the only way to ensure long-term viability. Again, it would be a mistake to simply follow these steps (or others like them) and expect change to result directly. As we’ve discussed at each post in this series, the many dimensions, structures, and complexities in organizations create challenges at every turn. Leaders recognize this, and adapt their approach over the life of the change effort. At the core of it, is a commitment. They can’t ever lose faith. To lose forward momentum is to accept defeat. We started talking in January on barriers to ‘2.0’, with the idea that ‘social media’ integration and, more broadly, ‘innovation’ itself faced many cultural barriers. Leading coordinated change initiatives (vs. traditional ‘change management’) appears to be the only truly viable path forward. It is truly ‘no small task’. But that’s not to say it’s impossible. It’s simply hard work. Call me old fashioned, but the sooner we start, the sooner we’ll be done. I say (again): let’s get going. Per our framing, we’ve spent the last several weeks exploring theories of culture change, ranging from Schein (dimensions) and Handy (structural forces) to Eoyang (complexity). Now let’s move to a specific scenario, to tie this all together. With focus on large organizations, the Federal Government is a good place to start. This is even more timely given the recent push by the Obama administration for “open government”. The President’s January 2009 “Open Government Directive” (OGD) mandated that agencies move to a more open, participatory, collaborative stance. As I’ve said in my GovLoop posts, that’s no small task. Let’s explore the cultural forces underlying the challenges ahead. Bill Eggers and John O’Leary in their 2009 book “If We Can Put a Man on the Moon: Getting Big Things Done in Government” offer some excellent insights, especially when held up to my prior posts on Schein and Handy. The Agency Dimension. Like Schein, Eggers/O’Leary recognize multiple dimensions. While they claim there is no overarching “government culture”, they identify several operating cultures for each agency, according to the mission of each. Without naming specific agencies, the authors categorize the space by role: enforcers, instructors, helpers, processors, builders/fixers, housekeepers and scientists. To each they assign a cultural mindset which drive behavioral biases. Their distinctions are useful, as they bring focus to diverse objectives of each agency. Semantics could be debated. But Eggers/O’Leary are pointed us in the right direction. This alone has value to OGD planners. Culture Clash: The Great Divide. But they also focus on an even more critical dimension: the divide between political appointees and civil servants. This is where Handy’s framework of 4 structural forces is immensely helpful. The political appointees in agency leadership roles follow Handy’s central, power-based, shorter horizon mindset. The civil servants? Clearly aligned (if not defining) the role-based, bureaucratic model, embracing structure, continuity, and focused on long-term horizons. That means a deep culture clash runs through the management chain of the Administrative branch of our Federal Government. Casual observers and insiders alike will quickly see this as ineffective, with compounding inefficiencies due to distrust and delays. Doubtless this was never part of the design. The U.S. Constitution is silent on culture. But the effects are nonetheless pervasive. Government moves slowly, often at cross purposes. Raising the Bar (Further). To make matters worse, our last post developed a very modern concept of effective collaboration that, when deployed into complex, highly structured organizations, favors adoption of still another cultural structure: Handy’s ‘task/network’ model. “Open Government” must be adapted and applied to the cultures of seven operational delivery models (per Eggers/O’Leary), supporting three non-aligned, competing structural forces. And that’s not to mention generational divides: a critical dimension to be certain, with yet another set of change factors. Path Forward with “OGD”. For Open Government to succeed, culture change must be taken on aggressively. Political appointees and civil servants must learn to see and to bridge their long-standing cultural divide. And both must seek to understand and adopt a new culture of networked collaboration that is inherent in the OGD vision, extending the work of government beyond its borders, involving and engaging citizens. Al Gore and his “NPR” team ran into these obstacles in the mid-1990s, when “Reinventing Government” took a run at these topics, but the challenges (or politics) of the day seem to have won out over lasting change. Perhaps not. Obama’s “Open Government” mandate appears to have a vital combination of leadership backing and increasing momentum. The Open Government vision is as strong as it is ambitious. Significant work lies ahead. But in corners of the world and even in Washington, that work is underway. What’s Ahead? Next post, I’ll make an updated pass at John Kotter’s well-circulated “8 Steps” toward cultural intervention. I’ll argue that all of his ideas still apply, but that they’ll need to be amended, at a minimum, to cope with complexity. Your input would be valued. In the special case of Government (which I’ll keep on radar) those updates will need to focus on the impact of 3 divergent cultures: political, civil servant, and collaborative .. as well as the many operational dimensions that compound those differences.